If you’ve read any of my VR game reviews before, you know that I love virtual reality for its ability to immerse you in a world and a role. Video games in general have allowed us to become other characters and beings for decades, but VR can really put you in the shoes–or in this case, furry feet–of the subject. 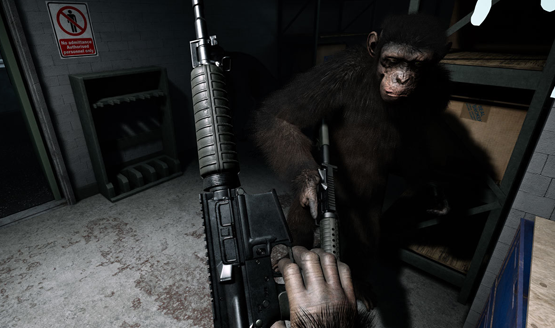 Embracing unique gameplay elements to really transform players into an ape, Crisis on the Planet of the Apes makes huge strides for virtual reality, yet has a number of pitfalls that make this a less than perfect experience. Crisis on the Planet of the Apes casts players as an intelligent ape caught up between the ape/human conflict. The story takes place between the events of Rise of the Planet of the Apes and Dawn of the Planet of the Apes, though knowledge of either movie isn’t necessary to understand the plot. In short, simian flu has wiped out over half of the population of the Earth and the surviving humans are convinced that intelligent apes hold the key to a cure. While not required, watching the new reboot trilogy of films will give a much more rich backstory to the world. Crisis of the Planet of the Apes holds more value as a companion to the series than it does on its own. The newer Planet of the Apes series has never been about the human characters as much as it is the story of the apes. Crisis’s unique perspective had me escaping from this militarized testing facility in an effort to return to the rest of the ape population. In order to amble forward, I had to swing my arms much like an ape might walk on their knuckles to propel myself to my destination. It seems a little bit odd at first, but I quickly got the hang of it and ended up loving the bizarre system of movement. With a simple motion like swinging my arms to move, I felt properly like an ape in a way that I might not have with a more traditional movement system. What breaks this sense of immersion is the on-rails experience that required me to select my next point every few feet. There was no choice of direction to travel. The game simply wanted me to know where I was headed next, and it was hardly handled eloquently. Reach towards point, press Move button, start swinging arms for a couple of seconds, repeat. This became the cycle of traversing through the dark and drab environments while on the ground. Some segments introduced climbing that required me to grip ledges, pipes, and other objects in order to pull myself along the climbing path. Again, the movement felt very ape-like, particularly while stealthily swinging on pipes above a bunch of doctors’ heads. Though I may have my VR legs, these portions could easily make players with weaker constitutions a little ill. There are no VR comfort options to be found for either those who want an unaltered experience or anyone who wants to make movement a little easier to bear. 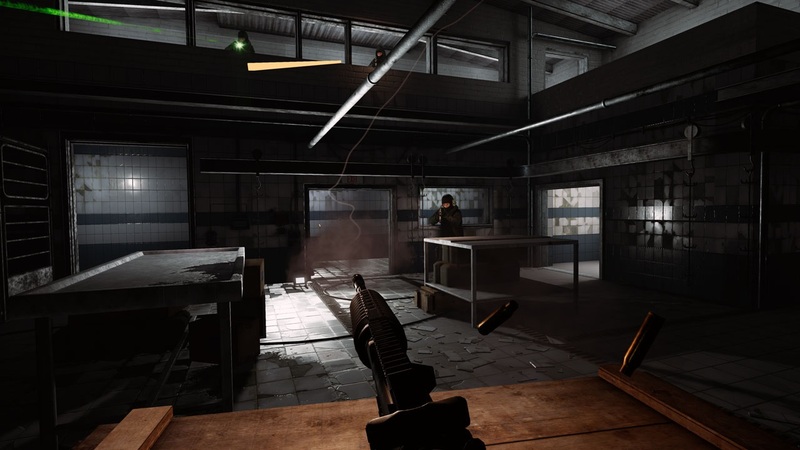 Eventually I got my ape hands on a couple of guns with shooting sections that played out not unlike Supermassive’s recent Bravo Team. In order to use the cover system, I simply had to grab the edge of any nearby object and pull myself around. I was still able to duck down physically, but the ability to grab objects and move myself around provided a lot more freedom. I ended up having quite a bit of fun with these segments. Nearing the end, they do begin to wear out their welcome as samey-looking environments begin to blur with waves of the same enemies doing the same things. Crisis on the Planet of the Apes occasionally introduces new and interesting mechanics, but never really plays into them beyond their introductions. The beginning of the game has you distracting a guard by pounding your chest and roaring, something that never crops up again. A couple of moments feature a guard getting taken out by leaping onto them (performed by thrusting both Move controllers upward as if you were making a big jump), but these are scripted moments along the path, not legitimate combat strategies. Firefights consist of little more than hunkering down and letting fly a bunch of bullets in the direction of your enemies until they are dead. The extremely linear experience then ends after only an hour or so of flailing, never seeing environments beyond the nighttime grays and browns that litter the entire 60 minutes. In fact, the game is so dark that my wife complained of not being able to see much that was happening on the second screen. This doesn’t matter much while in the headset, but you can get a look at just how dark and monotone the entire game is in the gameplay video and gallery above. Tonally, the single color palette never allows the more unique systems to shine in ways they otherwise could have. There’s also next to no reason to replay the game at all, except to try to rush through the levels even faster for trophies. According to the trophy list, the whole game can be finished in less than 40 minutes. Crisis on the Planet of the Apes shows VR players what it means to be an ape, not only putting them in the role of the fur covered creatures, but also requiring that they move and act like one too. By the end, I felt sufficiently ape-like. Crisis accomplished its goal of immersing me in the role, even if some of the more brilliant ape interactions were one-off moments rather than regularly used mechanics. Sadly, this brilliant immersion is hampered by dull environments, enemy encounters that become boring, and a fairly weak story that requires the films in order to mean much. Even then, the duration of the hour-long experience can be summed up simply by saying “ape escape.” Crisis on the Planet of the Apes creates some interesting new ideas for virtual reality, but it ends up tripping over its own big monkey feet along the way. 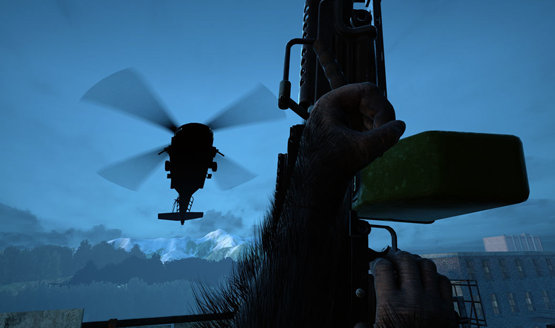 Crisis on the Planet of the Apes VR review code provided by the publisher. Version 1.00 reviewed on a standard PS4. For more information on scoring, please read our Review Policy.